Channel modeling is fundamental to design wireless communication systems. A common practice is to conduct tremendous amount of channel measurement data and then to derive appropriate channel models using statistical methods. For highly mobile communications, channel estimation on top of the channel modeling enables high bandwidth physical layer transmission in state-of-the-art mobile communications. For the coming 5G and diverse Internet of Things, many challenging application scenarios emerge and more efficient methodology for channel modeling and channel estimation is very much needed. In the mean time, machine learning has been successfully demonstrated efficient handling big data. In this paper, applying machine learning to assist channel modeling and channel estimation has been introduced with evidence of literature survey. Saud Aldossari expresses a great appreciation to Prince Sattam bin Abdulaziz University for their support of providing scholarship. Kwang-Cheng Chen appreciates FC2 Collaborative Seed Grant for the support of research. Jiang, Z., He, Z., Chen, S., Molisch, A.F., Zhou, S., & Niu, Z. (2018). Inferring remote channel state information: Cramér-Rae lower bound and deep learning implementation. In IEEE Global Communications Conference (GLOBECOM), (pp. 1–7). https://ieeexplore.ieee.org/stamp/stamp.jsp?tp=&arnumber=8648140&tag=1. Das, S. S., & Prasad, R. (2018). Evolution of air interface towards 5G: Radio access technology and performance analysis (river publishers series in communications). https://www.riverpublishers.com/book_details.php?book_id=521. Farsad, N., & Goldsmith, A. (2017). Detection algorithms for communication systems using deep learning. arXiv preprint arXiv:1705.08044. Feukeu, E. A., Ngwira, S. M., & Zuva, T. (2015). Doppler shift signature for BPSK in a vehicular network: IEEE 802.11p. In 2015 IEEE international conference on mechatronics and automation (ICMA), Beijing (pp. 1744–1749). https://doi.org/10.1109/ICMA.2015.7237749. Zhang, Y., Wen, J., Yang, G., He, Z., & Luo, X. (2018). Air-to-air path loss prediction based on machine learning methods in urban environments. 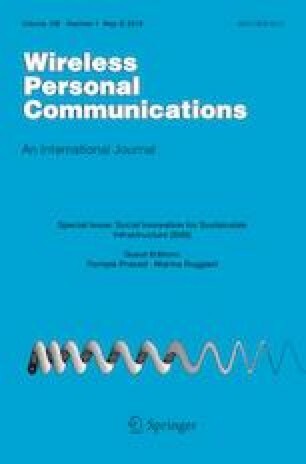 Wireless Communications and Mobile Computing, 2018, Article ID 8489326. https://doi.org/10.1155/2018/8489326. O’Shea, T. J., Erpek, T., & Clancy, T. C. (2017). Deep learning based MIMO communications. arXiv preprint arXiv:1707.07980. Farsad, N., & Goldsmith, A. (2018). Neural network detection of data sequences in communication systems. arXiv preprint arXiv:1802.02046. Zhao, X., Hou, C., & Wang, Q. (2013). A new SVM-based modeling method of cabin path loss prediction. International Journal of Antennas and Propagation, 2013, Article ID 279070. https://doi.org/10.1155/2013/279070. Li, Y., Zhang, J., & Ma, Z. (2018). Clustering in wireless propagation channel with a statistics-based framework. In 2018 IEEE wireless communications and networking conference (WCNC). Barcelona (pp. 1–6). https://doi.org/10.1109/WCNC.2018.8377218. Zheng, Q., He, R., & Huang, C. (2018). A tracking-based multipath components clustering algorithm. In 2nd URSI AT-RASC, Gran Canaria, 28 May 1 June. https://doi.org/10.1109/LAWP.2017.2740622. Keim, D. A., Mansmann, F., Schneidewind, J., & Ziegler, H. (2006). Challenges in visual data analysis. In Tenth international conference on information visualisation (IV’06), London, England (pp. 9–16). https://doi.org/10.1109/IV.2006.31. Hogstad, B. H., Patzold, M., & Youssef, N. (2005). A MIMO mobile-to-mobile channel model: Part I—The reference model. In 2005 IEEE 16th international symposium on personal, indoor and mobile radio communications (pp. 573–578). Berlin. https://doi.org/10.1109/PIMRC.2005.1651501. Matolak, D. W., & Wu, Q. (2009). Vehicle-to-vehicle channels: Are we done yet? In 2009 IEEE globecom workshops. Honolulu, HI (pp. 1–6). https://doi.org/10.1109/GLOCOMW.2009.5360694. Sun, S., MacCartney, G. R., & Rappaport, T. S. (2016). Millimeter-wave distance-dependent large-scale propagation measurements and path loss models for outdoor and indoor 5G systems. In 2016 10th European conference on antennas and propagation (EuCAP), Davos (pp. 1–5). https://doi.org/10.1109/EuCAP.2016.7481506. 5GCM. (2016). 5G channel model for bands up to 100 GHz. Technical report. http://www.5gworkshops.com/5G_Channel_Model_for_bands_up_to100_GHz(2015-12-6).pdf. Burghal, D., Wang, R., & Molisch, A. F. (2018). Band assignment in dual band systems: A learning-based approach, arXiv:1810.01534 [eess.SP]. 3GPP TSG RAN Plenary. Study on 3D-channel model for elevation beamforming and FD-MIMO studies for LTE. http://www.3gpp.org/DynaReport/FeatureOrStudyItemFile-580042.htm.